Groomers maintain pets' appearances. They usually work with dogs and cats. Groomers work in pet shops, animal shelters, veterinary clinics, and grooming services. Many own their own businesses and some operate mobile grooming services that make house calls. Nonfarm animal caretakers, a job category that includes groomers as well as other workers, held about 191,000 jobs in 2012. Groomers work in shops, kennels, pet stores and veterinary clinics. Those who are employed by or who own mobile grooming services travel to their clients' homes. People who work as groomers or in related occupations can be injured by the animals in their care. Frightened animals may bite or scratch their caretakers. While most newcomers to this field get their training from experienced groomers, others attend programs at state-licensed schools. Groomers can receive certification from the National Dog Groomers Association of America. Those interested in becoming certified can take an exam that has both a written and a practical component. In addition to training and certification, one should have certain soft skills, or personal qualities, to work in this occupation. A groomer must, obviously, like being around animals. He or she must be compassionate since the animals in their care are often anxious. Because a groomer's livelihood depends on keeping his or her human customers happy, good customer service skills are necessary. In order to understand pet owners' instructions and in turn convey information to them, they must be good listeners and have strong speaking skills. Physical stamina is another requirement, as groomers spend many hours on their feet, as well as kneeling and bending. One must be strong enough to lift pets onto grooming tables. 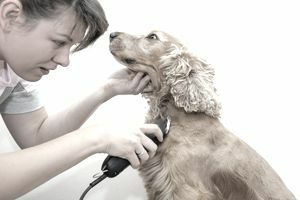 Entry-level groomers usually have one task, for example, bathing or drying pets. As one becomes more experienced he or she will take on all grooming tasks. Those working as animal care and service workers, including groomers, should see much faster than average job growth through 2022 due to an increase in the companion pet population. Nonfarm animal caretakers, including groomers, earned a median annual salary of $20,340 and median hourly wages of $9.78 in 2014. Bathe and professionally groom multiple dogs with varied temperaments. Clip or hand scissor animal's coat to match breed standards/owners wishes. Provide full-service grooming from bath through the cut to drying. Lift animals in and out of the tub. Thoroughly clean stations and disinfect entire grooming area at day's close. Source: Bureau of Labor Statistics, US Department of Labor, Occupational Outlook Handbook, 2014-15 Edition, Animal Care and Service Workers, on the Internet at http://www.bls.gov/ooh/personal-care-and-service/animal-care-and-service-workers.htm (visited July 29, 2015). Employment and Training Administration, US Department of Labor, O*NET Online, Nonfarm Animal Caretakers, on the Internet at http://www.onetonline.org/link/details/39-2021.00 (visited July 29, 2015).